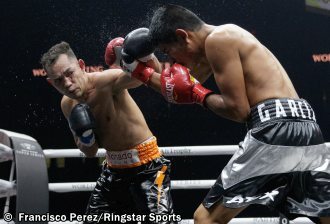 Fresh from a dominant showing against Mexican warrior Ruben Garcia-Hernandez in San Antonio, Texas, over the weekend, Nonito Donaire, Jr. said yesterday he’ll be ready for another crack at a world title in three to four months if that’s what Ringstar Sports CEO Richard Schaefer has in the cards when they discuss the future in Las Vegas next week. There was some confusion on his opponent’s name. It’s a Spanish custom that two surnames are used, the first is the father’s and the second is the mother’s. So the Mexican’s surname is actually Garcia, not Hernandez. TV commentators used Hernandez as his surname. On the waistband of his shorts, Ruben was at the front and Garcia was at the back. His robe was inscribed Ruben Garcia and his cornermen wore jackets that read Team Garcia. But there was no confusion as to who deserved the win. Judge Cathy Leonard saw it a shutout, 100-90 while judge Glen Crocker had it 97-93 and judge Luis Escalona 99-91, all for the Donaire who raised his record to 38-4, with 24 KOs. Garcia’s mark dipped to 22-3-1 as the loss snapped his streak of seven straight wins. Garcia, 24, is 10 years younger than Donaire. While Garcia hardly laid a glove on Donaire, the Filipino Flash surprisingly finished the fight with bruises on his forehead and left cheek. Donaire said it was due to head-butts. “Garcia would throw the left jab then come in with his head up,” he said. “I thought he was afraid and intimidated. Garcia held his hands high to cover up. He slowed down a lot even if he had good speed like he stiffened up. He knew if he threw the jab, I’d counter with a left or right so that’s why he was hesitant. The key was to control the fight, not to brawl, not to get hit.” Referee Laurence Cole, who worked Manny Pacquiao’s fight against Antonio Margarito in 2010, never warned Garcia for head-butting. Donaire, transformed into a proficient technician, taught Garcia a clinical boxing lesson he’ll never forget. He landed overhand rights and left hooks to the face, dug right hooks to the side of the body, threw dazzling combinations of three to four to five punches, doubled on the left jab, poked the midsection, connected with jarring uppercuts, sidestepped and backtracked to negate Garcia’s reach advantage and was as fresh in the end as he was at the start. “On a scale of 1 to 10, I rate my defense a 6 or 7,” he said. “I measured my distance, did a lot of head movement, backed off when I had to. He was awkward and off-balance so it was difficult to keep attacking because his head was everywhere. On offense, my rating was 5. I still have things to work on. I want to be faster, stronger.” Rachel said her rating was 7.5 overall.